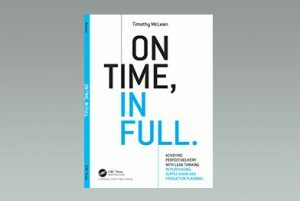 Over the years many manufacturers have adopted lean tools focused on improving the efficiency of production processes. However, often despite these efforts manufacturers still suffer downtime, poor productivity and missed deliveries. The cause is the inability to get materials to the right place in the right time and in the right quantity. Many companies know about Kanban and pull systems, but few seem confident to use them. Instead they often rely on cumbersome and ineffective spreadsheets. ERP systems also fail to offer solutions to many companies. A value stream map will show the process steps and, critically, the information flows that trigger the movement of materials and production jobs from one process to the next. From this you can develop your future state map. It is at this point you will probably get introduced to some new concepts for managing the flow of production jobs and materials. The first response many companies adopt to overcome problems with material shortages and late deliveries are to look for a software solution. I call this automating the chaos! There are very many systems available, but most offer a enterprise resource planning or ERP approach. In this approach the business enters a forecast for expected customer requirements in the future. This is called a “push” system since materials and production are “pushed” through the production process in anticipation of future customer demand. This approach relies on customer forecasts being accurate. If you are one of the many companies which cannot get accurate forecasts from customers, then the ERP approach will be ineffective. In a lean process we aim to achieve “flow”. This means that individual products flow from process to process in sequence. The ideal is “one piece flow” such as on an assembly line or production “cell”. Each process hands the product on to the next process without work in progress or delay between processes. Failing that, a “First in First Out” (FIFO) lane can be used to control work between processes. 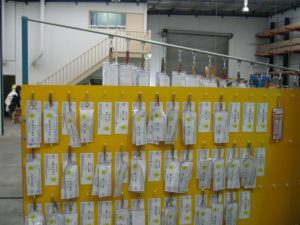 A FIFO lane has space for a limited amount of product, usually no more than a few hours of production. Once the lane is full the upstream process needs to stop. This controls the work in progress and ensures consistent, fast lead time for all products flowing between the two processes. Sometimes you can not achieve flow. For example, a process where it is necessary to run a batch of product such as heat treatment or plating or where set up times are too long to permit a batch size of one unit. Where processes have different hours of operation (e.g. one shift assembly vs. three shift machining) it can also be very difficult to achieve flow. In these situations a pull approach can be used. This means that production at the upstream process is “pulled” by the consumption of parts at the downstream process. Kanban cards like these trigger replenishment of materials. They are the most well know Lean material management tool, but by no means the only one. There are many different types of pull systems used in lean manufacturing processes. The one readers are likely to be most familiar with is Kanban. In a Kanban system a card is attached to each container of materials. As the materials are consumed on the production line the cards are removed and returned to the upstream process or to the supplier. 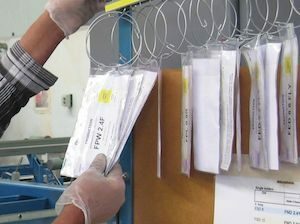 Parts are then picked or manufactured in the quantities specified on the Kanban cards, the cards are attached to the containers and the replacement parts sent back to the line. Usually multiple Kanban cards will be required for each part. 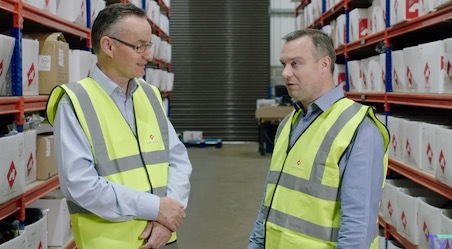 To calculate the number of cards you need to work out the lead time required to return the cards to the upstream process or supplier, to replenish the consumed parts and then to return these parts to the downstream process. You then need to calculate the maximum (not the average) number of parts that will be consumed by the downstream process over this replenishment lead time. Divide this by the number of parts per container to work out the number of Kanban cards you need in circulation for each part. You can then adjust the amount of parts in circulation up or down by adding or removing Kanban cards to the system. For small low value items, a two bin system can be a simple alternative to Kanban cards. In a two bin system a maximum of two bins of parts are held at the downstream process. The bins are usually clearly labelled with the part number and quantity of parts they are supposed to contain. One bin will be in use and the second bin will be full awaiting use. When the first bin is empty the operator drops it down a return chute or places it in a designated location for material handlers to pick up. The empty bin is then returned to the store, refilled and returned full to the line. The quantity in each bin needs to be enough to allow time for the empty bin to be replenished before the operator is using runs out of parts. Two bin systems work well, but rely on a short replenishment lead times as the parts must be replenished before the bin in use is finished. They generally only work for items that can be supplied from a store to the line or for items where the supplier offers regular (at least daily) deliveries. They are very commonly used for fasteners and consumables. As the replenishment lead time increases it becomes necessary to introduce more bins to maintain supply and the system reverts to the multi-card Kanban system. In many cases upstream processes that are supplying parts manufacture in batches. In this case a system is needed to accumulate Kanban requirements until the target batch quantity is achieved. One way to do this is to set up a Kanban control board as shown in the picture above. Kanbans are returned to this board and grouped by product. In this case the target batch size is four. When a product has four cards on the control board, the Kanban cards are then hung on the rail above the board. The machine operator then takes the cards in batches of four. There is no need for a production schedule as the order of production jobs is simply the order that the batches are loaded on to the rail. There are many other variations on pull systems for batch processes, but these require more detailed explanation than is possible in this article. (eg. shelving, racking or block stacked). Each part is then stored in a dedicated location to make checking stock easy. On a designated day each week (or each day if necessary), the locations storing that suppliers’ parts are checked and the quantity needed to restock the shelves is ordered. An even better alternative is to get the suppliers to restock the “supermarket shelves” themselves. WHAT TO DO IF YOU HAVE IMPLEMENTED KANBAN AND STILL HAVE SHORTAGES! Any system for controlling material requires a level of shop floor discipline and the systems described above are no exception. If products are not returned to their correct location or Kanban cards and product bins get lost, then the system will quickly break down. 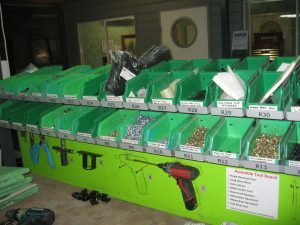 To create this level of shop floor control we frequently implement 5S techniques to create a discipline of a “place for everything and everything in its place”. The role of the front line supervisor is also critical in ensuring the system is maintained and improved. In our experience the effort is worth it. Shortages are typically reduced by more than 90%, customer lead times are cut in half and inventory reduced by 50%. The level of expediting and stress is also dramatically reduced – which is often the benefit that our clients enjoy the most!